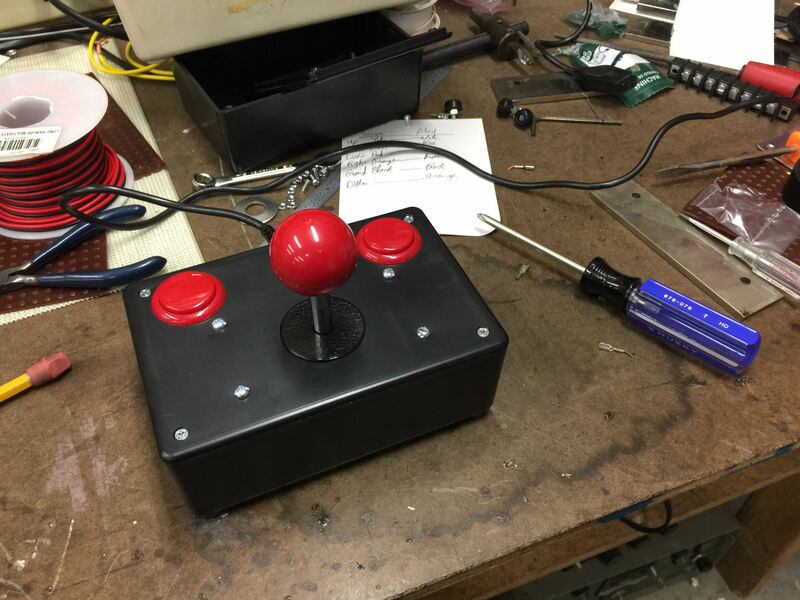 The very first joystick I ever built came about in late 2016 because I wanted to beat my high score at Nibbler on the Atari 800 (I was also playing a lot of Wizard of Wor at the time). Nibbler is a four-way maze game somewhat in the spirit of Pac-Man combined with Snake, and in the later levels you have to have split-second reflexes to make the turns needed to survive. None of the Atari joysticks I had (I probably have about 20 different models) were cutting it. So I thought it would be fun to make a real arcade 4-way joystick for the Atari. It had to have a 4-way restrictor plate so I couldn’t accidentally hit a diagonal and make a wrong move. I also wanted to make my brother a Christmas present that year, so I planned on making two of them. I dug through his workshop around and found some vintage plastic project boxes, screws, rubber feet, and steel weights. Then I got a cable from one of my old Atari joysticks still sitting in my moms’ garage at the time. From there it was just a matter of seeing how I could fit it all in the box, cutting holes with his old drill press, and wiring it up. The result ended up being the prototype of the BX-80. Aside from some minor part/wiring tweaks on the inside and how I mount the stick, the BX-80 I sell now is basically the same device I made that day, within a couple hours, at my mom’s house. It has a button on each side so you can either hand-hold it like an Atari CX40 or set it down on a table and use your other hand to pound away at the buttons for a shooter game. And it’s weighted inside and rubber-footed on the outside so it stays put. I wrote about it briefly on VC&G back in 2016. In 2016, I ended up making only one joystick. I played with it for a while, loved it, but I gave it to my brother for Christmas. I thought I would build another one for myself, but the season passed, things came up, and I never got around to it. Fast forward to earlier this year when I was broke after a tough house move and a canceled exhibit that I had spent a lot of time and money on. I was trying to figure out what I could do as a service to make money. 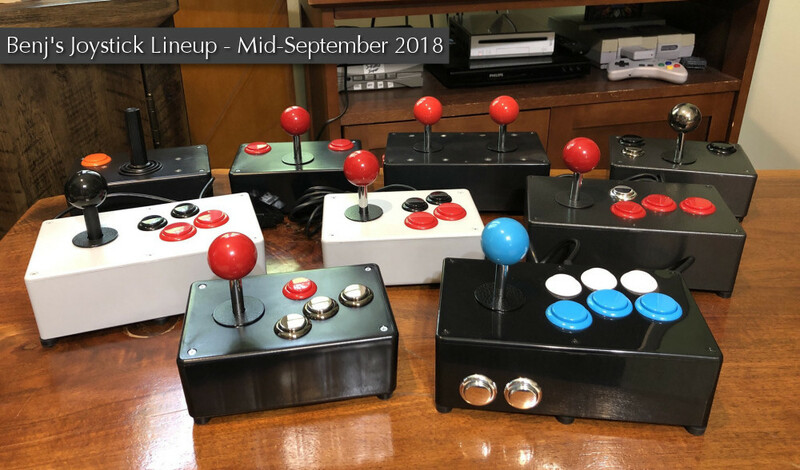 I looked around my garage and found the unbuilt parts for my second joystick, then took to Twitter to ask, on August 1st, 2018, if anyone would like me to build them a joystick. Some time ago I built a custom Atari/Commodore joystick with arcade parts, and it's awesome. Weighted, rubber feet. This one has a 4-way limiter for maze games like Pac-Man. The response was enthusiastic. 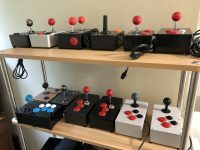 140+ joysticks (36 of which were BX-80s) and three months later, I am still making joysticks. People on Twitter kept challenging me to make sticks for different systems, so within two months I had a huge collection of designs. It started off with a single model, the BX-80, for Atari/Commodore systems. 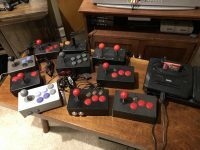 Then within two months I had built a dual-stick unit for Robotron: 2084 on the Atari 800 (the BX-85), then a variation on the CX40 stick (BX-40), then a NES stick (BX-90), a smaller NES stick (BX-91), a Genesis stick (BX-95) and its little brother (BX-96), an Atari 7800 stick (BX-87), a 6-button Genesis stick (BX-100), a PC Engine stick (BX-88), and a Super NES stick (BX-110). The chronology may be a tad out of order there, but you get the idea. Along the way, I’ve advanced from using hacked control pad guts (for NES, Genesis, SNES) to using custom-designed circuit boards. I’ve refined my production methods, and the quality I can produce is higher than ever before. And it’s only been a few months. If I keep going, who knows what my joysticks will look like a few years from now. It’s bound to come up at some point in the future, so I’ll address it here: What is with the BX model names, and my new company name, BX Foundry? As for where CX40 comes from, no one has yet documented the true origin of the CX product naming model scheme from Atari, but we know that C stood for Consumer. I should probably ask around about it before we lose all the Atari veterans. Where Can I Buy My Own BX Foundry Joystick? At the moment, I am still setting up a proper BX Foundry website and shopping cart. But if you’re interested before that happens, you can always DM me on Twitter or send me an email. There is another way to order a BX Foundry joystick at the moment. 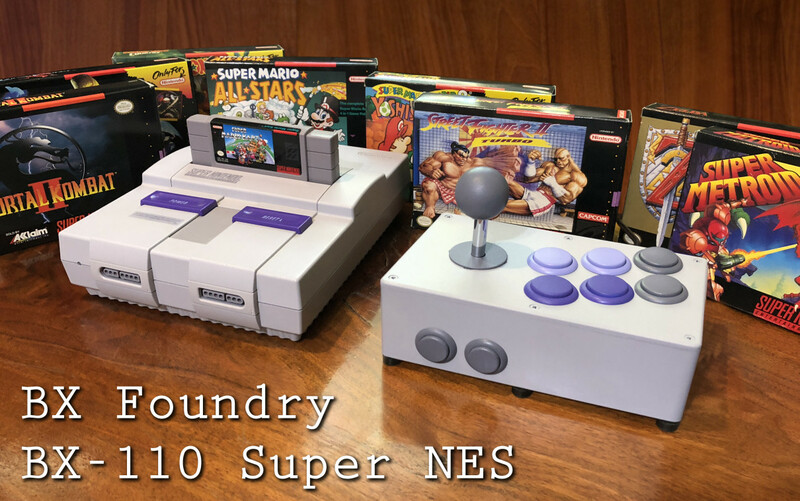 As we speak, I am trying to raise money for a deluxe Super NES stick called the BX-110, which I am producing using custom-colored molded plastic buttons (and potentially the body, if funds allow). If you’re interested, visit this page to read more about it. You can also order from there. 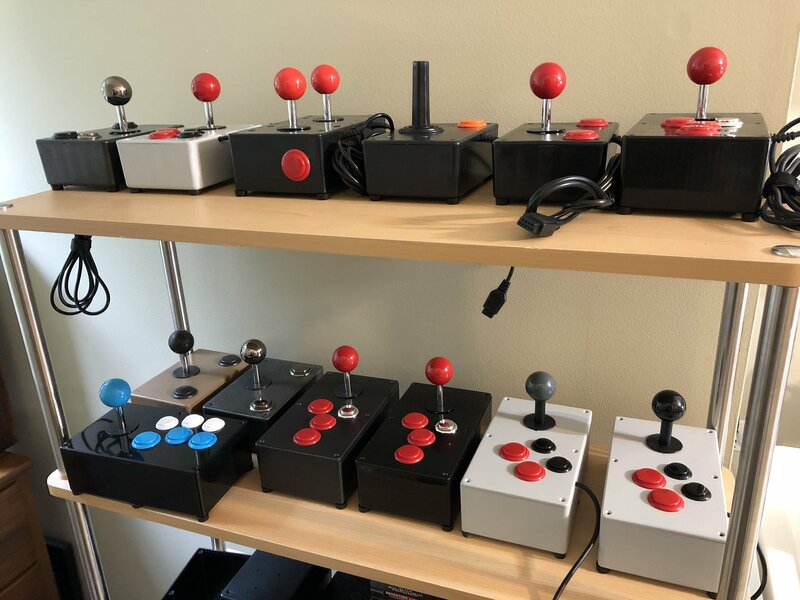 Every order helps quite a bit toward growing this cottage joystick business so I can sell more joysticks to more people, which I would love to do. With all the rapid developments I’ve been making in my craft, I am excited to see what’s up ahead. This entry was posted on Monday, November 26th, 2018 at 4:23 pm	and is filed under Computer Games, Computer History, Gaming History, Hacks & Projects, Hacks & Projects, NES / Famicom, News & Current Events, Retrogaming, VC&G Announcements, Vintage Computing. You can follow any responses to this entry through the RSS 2.0 feed. You can skip to the end and leave a response. Pinging is currently not allowed. Congrats on the new business venture Benj! 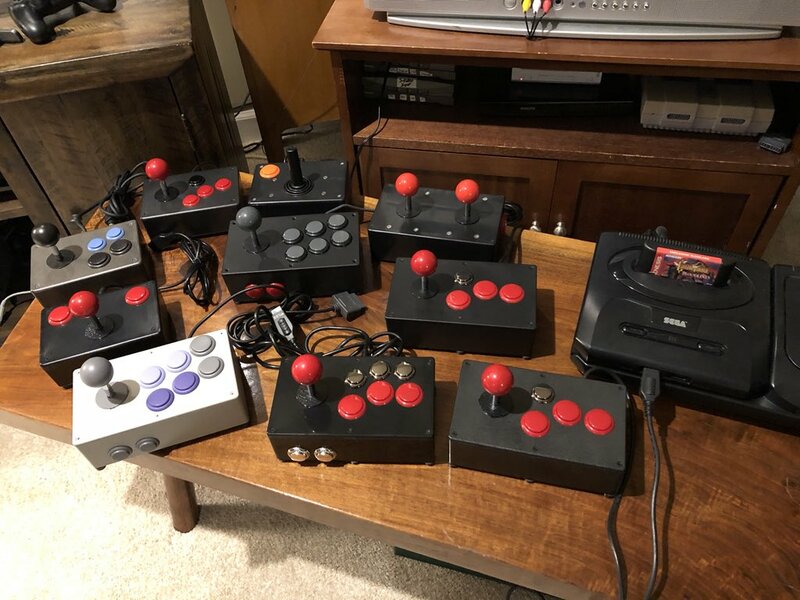 I really don’t have too many old consoles laying around that I would new arcade sticks for since most of the vintage gaming I do is emulation on my computer and generic gamepad encoders work fine for those. Are the circuit boards you use for encoding common ground or something else? Back in the days I wore out both of my OEM Atari joysticks, then picked up a Wico joystick that was leaps and bounds better. I kind of regret giving away my 2600 (and joystick) to a friend. There was an arcade machine sales/repair place fairly close to home, so I bought the parts needed to create my own joystick for a commodore 64 (this was in 1983). I actually built it into my desktop. Worked great, but limited the functionality of the desk somewhat.